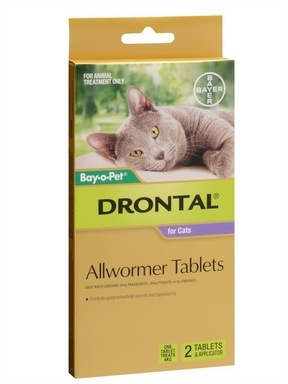 Drontal for Cats controls all gastrointestinal worms in cats, including roundworms (Toxocara cati, Toxascaris leonina), hookworms (Ancylostoma tubaeforme, A. braziliense, Uncinaria stenocephala), and tapeworms (Dipylidium caninum, Taenia taeniaeformis). Warnings, Side Effects and Drug Interactions: Drontal is safe to use in elderly animals, kittens, pregnant and nursing females and in show animals. This medication is not formulated for dogs and is not suitable for use in canines. Drontal for Cats may be safely combined with other treatments, such as flea and tick treatments. Dosage and Administration: Administer orally on an empty stomach. Dosing is based on bodyweight. Kittens should be wormed at 6, 8, 10 and 12 weeks, then at least every 3 months throughout adulthood. Females should be treated prior to mating,10 days before the kittens are born, then at 2 and 4 weeks after kittening, in addition to the usual adult treatments. I've been a customer of Pet Shed for years and I always get my cat wormers from you. Shipping takes about two weeks. Customer service is great. And most importantly, your products are very cheap! Best wormers ever! And the cheapest too. Thanks PET SHED! All year worm free with Drontal! wormers here are just the same with the local vet but definitely at a lower price. Love Pet Shed! Buying only branded and the best one for my two cats. I'm giving them Drontal since they were kittens. Since they were kittens, I've alredy been using Drontal to deworm my cats and I'm satisfied with the results. I let my cats play outdoors and they are all still worm free. I love getting wormers from Pet Shed! Aside from it's very convenient to shop, the wormers are definitely cheaper. I'VE TRIED OTHER WORMERS BUT THEY'RE NOT EFFECTIVE. WITH DRONTAL I'M NOW CONFIDENT THAT MY CAT, EVEN SHE PLAYS OUTDOORS, WILL NEVER CATCH ANY WORMS. I have dogs and cats and only trust Drontal for them. My cat Gracie loves this so much. It's like a treat for her. This is still better than generics. My cat won't resist this one. He enjoys having his wormer.